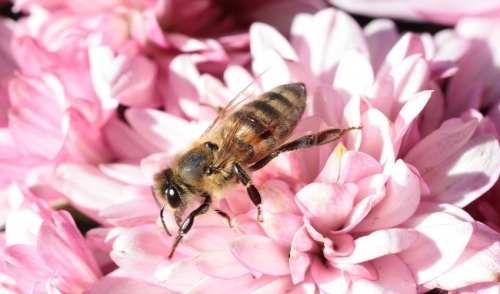 Bees are critical pollinators essential in the garden and flowerbeds. A yard with a healthy bee population will have larger crops of healthier fruits, vegetables and flowers, and it is important to offer plenty of different plants that will entice bees to lend a helping buzz in the garden. Just adding a few plants bees love to the yard will not increase the bee population dramatically, but if those plants are added thoughtfully and a few other simple steps are taken, the entire garden will be a-buzz with busy pollinators. Choose native plant varieties whenever possible, as they will be more recognizable to bees and will be better suited to local growing conditions, soil and climate. Diversify plantings to provide abundant blooms from early spring to late fall so bees have a continuous source of pollen and nectar in the same area. Create a varied garden with bee-friendly plants in a variety of colors (bees are especially fond of yellow, blue, white and purple) and at a variety of heights to attract more bees. Minimize pesticide and herbicide use that could be detrimental to bees, and if chemicals are necessary, be sure they are applied correctly. Plant flowers and other bee-friendly plants around the garden, such as in the corners or between rows, to encourage bees to pollinate fruits and vegetables too. Add a bee house to the yard to give bees appropriate shelter and a place to build their hives so future generations will be available for more pollinating duties. Provide a source of water suitable for bees in the yard, such as a shallow tray with several pebbles or rocks that will allow bees to reach the water safely. 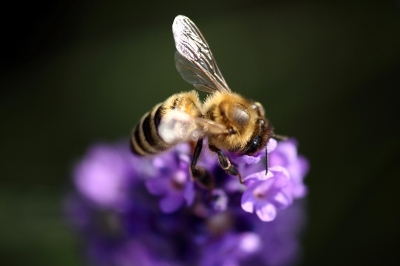 Bees are the best pollinators available, and a bee-friendly yard and garden will be one that is filled with fragrant flowers, vibrant vegetables and flavorful fruits to enjoy all season long.